I’m happy to report that I have the LG WH16NS40 NS50 drive, and it works just fine. 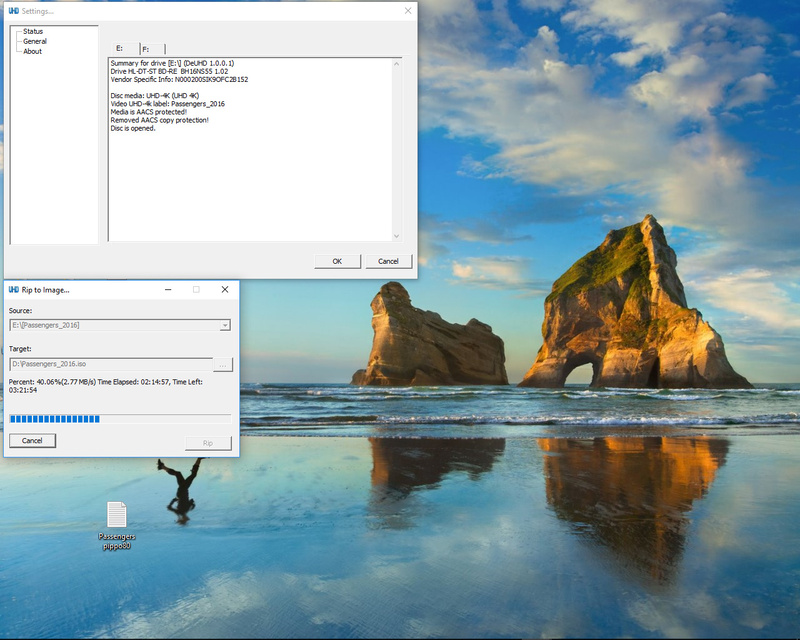 In addition, I can play the decrypted disk directly in PowerDVD 17, even though my drive is not technically supported, and my monitor is not HDCP 2.2 (or HDR, or even 4k). I do have a Z270 Mobo and Kaby Lake CPU, so I pass the SGX test. I own three of the movies on their list. The first one (Fantastic Beasts) said it wasn’t supported. Passengers worked. I was unable to test the 3rd, because at that point it just says you can only use 1 disc with the trial, and doesn’t say if it was able to decrypt it or not. I can rip the same disk over again (I haven’t completed a full rip yet, so this isn’t 100% certain, but I’ve played the disc with PowerDVD, MPC-HC, and multiple restarts of Rip to Hard Disk…). If I disable all network access it doesn’t interrupt a rip in progress, and I can even cancel and restart it, but if I remove the disc and re-insert it, it requires a network connection before it will decrypt it again. Oh, and MKVToolNix, but the remux stalled out at 7%, presumably because I had hit the 8-10 minute limit so DeUHD was delivering garbage, and MKVToolNix couldn’t parse the m2ts anymore. Oh yeah, they’re definitely not downloading it off the internet on the sly. When I first installed it, it was SUPER slow whenever I tried to do anything, and I could hear my drive seeking like crazy. I had to crack open Process Monitor, to discover explorer.exe was reading stuff (presumably to generate thumbnails?). Once I killed that process, it can mostly keep up with realtime. I’m currently ripping at 3.96MB/s, and my network is idle (under 100Kbps). I’m not an AACS expert, so I don’t know if this even makes sense, but my guess is they’ve found a way to steal the individual volume keys out of PowerDVD’s memory, and are just building a database of them, and distributing them to the client when you put a disc in. I don’t have time to do network captures (and/or set up a MITM that they may or may not be able to detect and stop) to try and figure out what their server communications are.